Thank you guys SO, SO much for all of your kind words about my Bjork costume and our Peter Pan & the Lost Boys costumes. It's always nice when a labor of love (or 3 or 4) is well received! I hope you are having a wonderful week so far! I like this relaxed look on you - well, I like all of your outfit posts. Thanks for sharing your Weekly Wears! you look so damn gorgeous, Katie! your sweater is amazing! :) also, I'm so much loving that first picture!! Another gorgeous outfit Katie! :) Loving the sweater, a lot! Enjoy your weekend away! Girls' trip sounds so much fun!! Hope you will share some pictures :) Cute as a button with the mustard hat and the maroon sweater. you are so pretty! i love that sweater on you. and that hat is too cute! I love that sweater! Ok, I love this whole outfit! First of all, your family is the cutest- and the Peter Pan costumes were pretty great, too! Secondly, I was wondering about your purse. I fell in love with that purse (in brown) on etsy a few months ago, but I didn't purchase it because I wasn't sure if it would reasonably hold my DSLR camera. Can you speak to that? Obsessed with this outfit, especially the sweater. I love your sweater! It's fantastic! I actually love the whole outfit, but the sweater makes me excited! I am a fan of this cozy look. 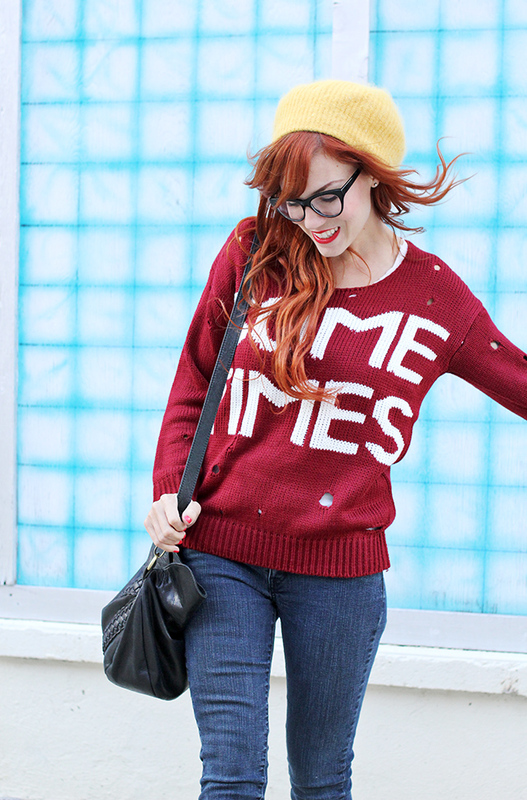 Really cool sweater. I would do unspeakable things to get my mitts on those ridiculously cute boots...except spend money, of course! In all seriousness, you look wonderful, and your hair is magical. Tutorial, perhaps? I love those jeans! I can never find Levi's that are that form-fitting. How did you snag yours? I love that you said you are a fan of every season -- because that's me exactly! I always feel the pressure to enjoy fall, but I love all of them. That sweater reminds me a bit of Kurt Cobain, and I love it. I love your whole outfit! Looks super comfy and warm!